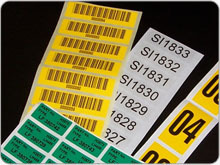 Thermal Transfer printing provides finished labels with variable information data via computer driven software produced on stand alone thermal printers or an in-line combination press of hot foil and thermal. 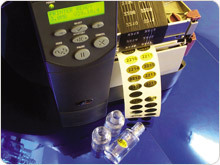 High speed dedicated printers enable high definition bar code label production with secure confidential data protection. A full range of specific label materials/adhesive combinations available for all applications including high performance materials for durability and outdoor use.